"I'm sometimes asked who I would vote for if I were enfranchised in this election, and I think that, with due hesitance, I would vote for Ahmadinejad," Pipes said. The reason, Pipes went on, is that he would "prefer to have an enemy who's forthright and obvious, who wakes people up with his outlandish statements." whoever is elected president, whether Mahmoud Ahmadinejad or his main opponent, Mir Hossein Mousavi, will have limited impact on the issue that most concerns the outside world – Iran's drive to build nuclear weapons, which Khamene'i will presumably continue apace, as he has in prior decades. Therefore, while my heart goes out to the many Iranians who desperately want the vile Ahmadinejad out of power, my head tells me it's best that he remain in office. 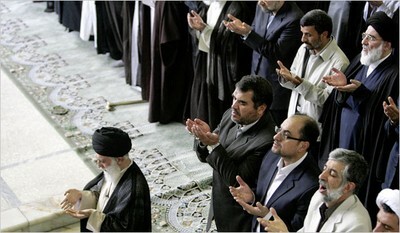 Supreme Leader Ali Khamene'i (left) and President Mahmoud Ahmadinejad (second from right in the back row) praying in Tehran on June 19. The startling events in Iran in the week since the election, however, have transformed Mousavi from a hack Islamist politician into the unlikely symbol of dreams for a more secular and free Iran. In the words of Abbas Milani, my colleague at the Hoover Institution, "If Ahmadinejad survives, it will be on the back of a Tiananmen-style crackdown. If Mousavi prevails, it will be on a wave of reformist sentiment." While that reformist sentiment may not shake the regime and is unlikely to stop the nuclear weapons program, it does hold out hope for substantial change.